Phitsanulok province covers some 10,584.5 sq. km. The riverside provincial capital is 377 km. North of Bangkok. 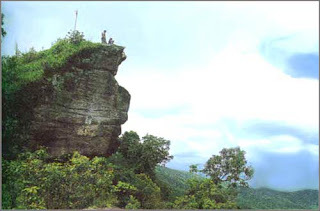 Phitsanulok is situated on the geographical and administrative line uniting the central and northern regions. 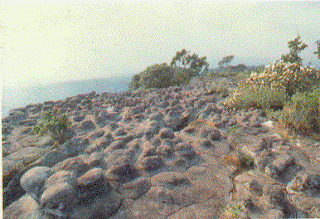 Phitsanuloke, located in Central Northern Thailand is a modern city. Ideal as a stepping stone for the Northern visitors attractions including Sukothai. 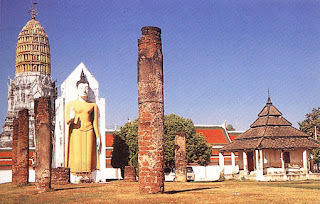 Phitsanulok was the birthplace of King Naresuan the Great of Ayuthaya (reign : 1590 - 1605), and his brother Prince Ekathosarot. Phitsanulok has long been an important center for political and strategic reasons. Phitsanulok was a major center of recruitment when Ayuthaya waged war with Burma, and was the capital of Thailand for 25 years during the 1448-1488 reign of Ayuthaya’s King Boromtrailokanat. Wat Phra Si Rattana Mahathat his monastery commonly called by the inhabitants as "Wat Yai" is the most important monastery of Phitsanulok, the home of the famous Phra Buddha Chinnarat. It is located at the foot of Naresuan Bridge on the city side of the river.The monastery was built in the reign of Phra Maha Thamma Racha I (Phraya Lithai) In 1357 A.D. It houses the Phra Buddha Chinnarat regarded as the most beautiful Buddha image in Thailand. It is cast in the attitude of subduing evil. 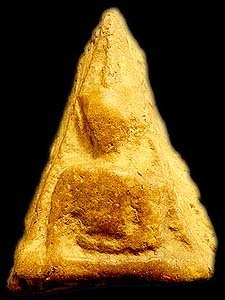 Later, in 1631, King Ekatosarot graciously bestowed some of his gold regalia to be beaten into gold - plate and applied them to the image worth his own hands, creating its most beautiful Buddha image. There are many other beautiful and noteworthy items in the monastery compound. The mother - of - pearl inlaid wooden doors of Vihara are especially splendid, and were built by King Boromkot in 1756 as a dedication to phra Buddha Chinarat. Behind the Vihara, there is a large Prang 36 meters high, with a staircase leading up to the niche containing the Buddha relics. In front of the Prang, there is Phra Attharos, and on the 9 room Vihara slope. 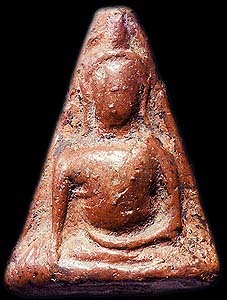 There remains only the newly-renovated Buddha image. Wat Ratchaburana nad Wat Nang Phya Is located on the eastern bank of the Nan river, near Wat Phra Si Rattana Mahathat to the south. These two monasteries, assumed to be built when Phitsanulok City was ruled by King Boromtrailokanat, have linking compounds. 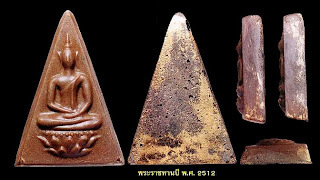 Wat Nang Phya has temple or bot but it is known for the so-called "Phra Nang Phya" votive tablets special fine form of the 3-head nagas decorated on their eaves. King Naresuan the Great Shrine The shrine is located in the compound of the Phitsanulok Phittayakom school, and depicts the seated king ceremoniously declaring Ayuthaya's independence from Burma. 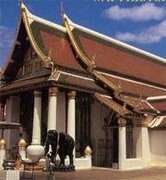 The shrine was constructed on the site of the Channdra Palace where King Naresuan was born in 1555. All resort accommodation features comfortable beds, cable television, modern bathrooms and spacious living areas.Most have private verandas to give you the feeling of staying right within a rain forest. All cottages are located discreetly throughout the resort amongst trees and ponds and some overlook the waterfall and river. All all furniture and fittings have been designed with the atmosphere of the rain forest in mind. Attention has been given to the finer details in decor and facilities, ensuring that your stay is comfortable and memorable. Spoil yourself at the Rain Forest Resort. 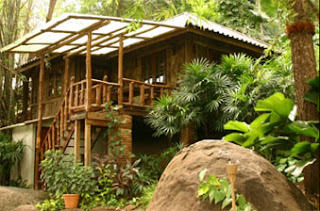 The Rain Forest Resort offers luxury accommodation within the wonder and uniqueness of a Thai tropical rainforest. Situated near beautiful Kang Song Waterfall, the resort is surrounded by National and Historical Parks of Northern Thailand meaning that this pampered retreat is within the realms of the natural environment. The restaurant is designed like a large open tropical tree house with all tables having views of the rainforest. Spread over four levels, there are aquariums and greenery surrounding the central waterfall and pool. An extensive Thai menu is featured and the speciality is local freshwater fish. Hours: 8:00 am – 9.00 pm. A specialty of the Wang Thong district is its coffee and the restaurant features this on its menu. The Rain Forest and Rock Forest brands are a blend of Arabica and Robusta coffees and are popular with all patrons. Bookings for white water rafting can be made at the resort. Join these popular guided adventures down the rapids of the Khek River . With difficulty ranked at between levels 3 and 5, this adventure is serious fun! Available June – October. Bicycles are available at the resort for exploring the riverbanks and local villages. Self drive vehicles or all day touring taxis can be booked at the resort. No Thai resort would be complete without a massage service and the Rain Forest Resort has excellent staffs who can provide you with a traditional Thai massage. Behind the Vihara (Wat Phra Sri Rattana Mahathat : Wat Yai), there is a large prang 36 meters high, with a staircase leading up to the niche containing the Buddha relics. 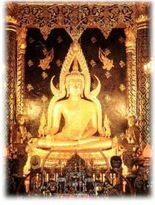 In front of the prang, there is Phra Attharos, and on the 9-Room Vihara slope, there remains only the newly-renovated Buddha image. 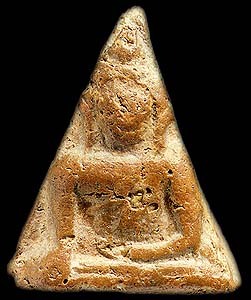 King Borommatrailokanat (often short Trailok, 1431-1488) was king of Ayutthaya 1448-1488. Born as Prince Ramesuan, he followed his father Boromma Ratchathirat II as king in 1448, then adopting the name Borommatrailokanat. In 1436 he moved his capital to Phitsanulok. Lanna had unsuccessfully besieged the town in 1459 and 1460, and also Sukhothai rebelled, weaking the northern boundary. The move of the capital was performed to strengthen his control in this area. The traditional ministries of Thailand - the Kalahom for the military and the Mahatthai as the civilian duties - were introduced by Trailok. 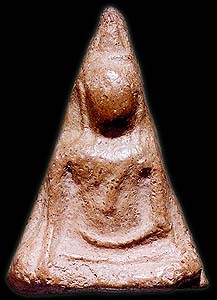 Also in his reign the hierarchies of the nobility were first codified, petty official having a sakdi na (field power, with one field measuring 1 rai = 0.16 acre) of 50 to 400, up to 100,000 for the uparat (hier-apparent). These structure were continued until the reforms of King Chulalongkorn at the end of the 19th century. 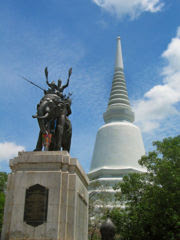 This monument is locate4d in the vicinity of Tambon Don Chedi, Amphoe Si Prachan, 31 kilometers from the township area. The pagoda was constructed by the royal command of King Naresuan the Great to command his victory against The Crown Prince of Burma (King Mahauparacha) in single hand elephant back combat. Found in 1913 in ruined condition, only the base part can be seen. It was renovated having a new pagoda covered the original one in the year 1952 by the government. A cast status of King Naresuan the Great mounting the elephant's neck was placed in front of the pagoda. An annual fair celebrating the monument for seven days and seven nights commences on the 25th of January which is regarded as Royal Thai Armed Forces Day. The celebrations include historic shows, folk entertainment and shops selling all kinds of merchandise and service. Pra Naresuan was born in Phitsanulok. Phitsanulok was under the force of Burma. 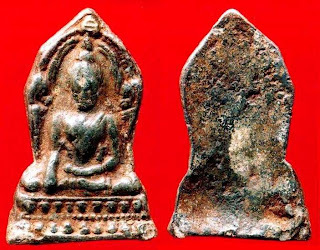 King Burengnong directed key person to be hostages,one of them was Pra Naresuan, who was 9 years old, to live in Hongsavadee. On August, Burma was victorious on Ayuddhaya. King Burengnong appointed Pra Mahathammaracha to be king. 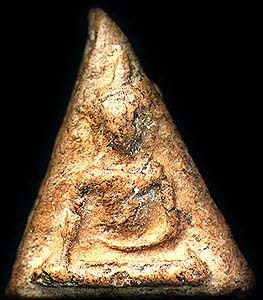 King Mahathammaracha promoted Pra Naresuan to the position of Crown Prince governing Phitsanulok. After the decease of king Burengnong, King Angwa became recalcitrant Nantabureng, the new king of Burma, promoted Mangraikayauchava to the position of crown prince. Pra Naresuan attacked Kung Kingdom, and catch the prince of Thai Yai and send him to Hongsavadee. King Naresuan was proclaimed independent at Muang Kreang in May at 19.00 After that Ayuddhaya was in the war with King of Chaing Mai and Praya Pasim. The troops couldn’t get close to Ayuddhaya. The troops of Nantabureng went to Ayuddhaya. The troops of crown prince Mungraigayaochava had forced Kamphengphet but Pra Naresuan was fighting to gain Kamphengphet back. Hongsavadee troops surrounded Ayuddhaya for 5 month, the troops couldn’t attack with Ayuddhaya. So, King Nantabureng decided to go to Burma for retreat his troops. Then King Naresuan and his brother attacked with the navy troops, so that King Nantabureng came back urgently. King Mahathammaracha died in June. His age is 75 years old. Pra Naresuan promoted to be king when he was 35 years old and promote Pra Akathotsarot to be the crown prince. After that 4 months the Burmese crown prince took the soldiers to attack Ayuddhaya but they can’t fight with the troops of King Naresuan. The Burmese Crown Prince took soldiers to attack Ayuddhaya. King Naresuan and Pra Akatosarot led soldiers to Supanburi province to defend the capital. King Naresuan killed the Crown Prince of Burma on the elephant back. Therefore, won the war which would later be known as Yuttahatthi War. King Naresuan and Pra Akatosarot led soldiers to Kumpa and send to the King of Nakhonsrithammaraj. After that they attack Kampucha and forced it. 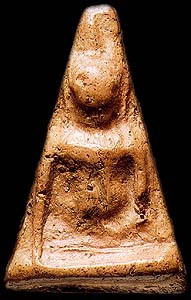 The southern of Morn was forced by Ayuddhaya. King Naresuan and Pra Akatosarot led soldiers to Hongsavadee in December but the troops can’t get close to Hongsa. So they came back. King Naresuan and Pra Akatosarot led soldiers to Hongsavadee again but Hongsa was destroyed because King of Thong Ou attack before. After King Naresuan and Pra Akatosarot led soldiers to Thoug Ou and the troops can’t get close to there. He came back in May. In November, King Nantabureng died after that Burma spend to 3 troops. King Ang Wa promoted to be the King of Burma. In the name of The King Srihasuthammaracha. King Naresuan and Pra Akatosarot led soldiers to Chaing Mai for to attack Ang Wa but he was sick from decease. 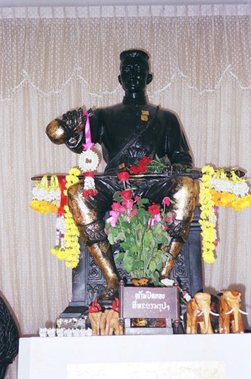 King Naresuan died at Muang Hang when he was 50 years old. Sappraiwan Grand Hotel and Resort, An exclusive resort located on a superb site in Phitsanulok province, Surrounded by beautiful mountain and lively river. The first class resort in situated on 373 acres of exotic landscapedgrounds consisting of lush garden, tranquil lotus ponds and tropical floras year around Sappraiwan Grand Hotel and Resort provides a stunning form of relaxation. It has the facilities as well as the elegant accommodation. Fifty-three kilometres away from Phitsanulok, Sappraiwan Grand Hotel & Resort is located on the Phitsanulok-Lomsak Highway. The resort, nestled on the beautiful mountain and surrounded by many famous tourist attractions, namely Khao Khor, Tung Salang Luang National Park, Phu Hin Rongkra National Park, and many cascading waterfalls. Besides, you can explore Phitsanulok City which is rich in historical, artistic and architechural significance. A variety of indoor and outdoor sports venue is one of the main features of Sappraiwan, Facilities include snooker, table tennis, fitness center, sauna, rafting (seasonal) and bikecycling or just take a big splash at the swimming pool. 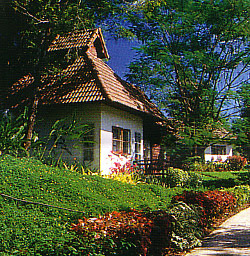 Enjoy a full range of recreation facilities at Sappraiwan Club House. The two-storey building features its own spacious balcony with river or garden view. There are many facility for you to take a rest with classic furniture, Television, refrigerator and telephone The house, scattered throughout the hill, ideal for guest who need to relax in privacy. 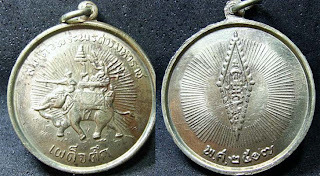 This amulet was made in 2507 at Phitsanulok, for front side is King Naresuan the Great on elephant and back side is Oak Lao Yan (Cabalistic writing - sign of Phra Buddha Chinnaraj). 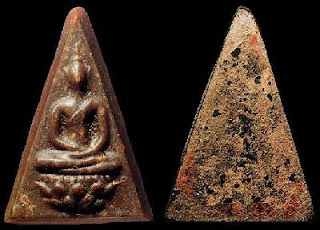 Phra Buddha Chinnaraj Bai Sema, first founded at Wat Phra Srirattanamahathat (Wat Yai) Phitsanulok and became the one of Phra Benjaphaki (5 amulets) Metal version. Chinnaraj Bai Sema was made over 600-700 years ago. For this amulet has 3 size. And also Chinnaraj Bai Sema has the Clay version but more famous in Metal version.